Sciatica is a leg pain that is caused by a pinched or strained nerve in the lower portion of the back. Although the pain tends to begin in the nerve roots, which are found on either side of the lower spine, they pass through the sciatic nerve. The sciatic nerve runs right through the piriformis, a tiny and very powerful muscle that is found deep in your glutes and will help you rotate your hips. If it becomes too tight, it can interrupt the sciatic nerve and cause extreme pain, tingling, and numbness. The pain you feel in the leg is called radiculopathy and is often worse than the pain felt in the back. The pain felt in the back can be tolerated most of the time, but the pain felt in the leg can become extremely intolerable and has, at times, been compared to the pain of a toothache. You may have sciatica if you are experiencing constant pain on only one side of the buttocks or leg, pain that worsens while sitting, weakness, numbness, difficulty moving the leg or foot, or a sharp pain that affects your ability to walk or stand. 1. Lumbar herniated disc: When a herniated disc occurs, it’s when the soft inner core of the disc leaks out or herniates through the fibrous core (annulus) and will irritate the nerve root. 2. Degenerative disc disease: Disc degeneration is a common and natural process that occurs with age. For some people, multiple degenerated discs in the lower back can irritate a nerve or root and cause sciatica. A degenerative disc will be diagnosed when inflammatory proteins from inside the disc are exposed and irritate the nerves. 3. Isthmic spondylolisthesis: When this condition occurs, a small stress fracture allows one vertebral body to slip forward onto another—as a result, the nerve could get pinched and cause sciatica. 4. Lumbar spinal stenosis: This condition causes sciatica due to a narrowing of the spinal canal. Lumber spinal stenosis is related to the aging of the spine and is common for adults over the age of 60. This condition results from enlarged face joints, overgrowth of soft tissue, and bulging discs placing pressure on the nerve roots, which causes sciatica pain. 5. Piriformis syndrome: The sciatic nerve can become irritated if it runs under the pirformis muscle in the buttocks. If the piriformis muscle irritates or even pinches a nerve root that compromises the sciatic nerve, it can cause sciatica pain. 1. 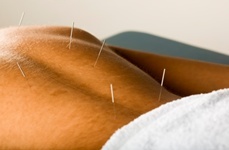 Acupuncture: You could experience relief after the very first session of acupuncture—but you will need about 12 sessions to see significant improvement. In a study that was recently published in the Mem>Journal of Traditional Chinese Medicine, 17 out of 30 participants who had sciatica pain got relief from acupuncture. Ten saw their symptoms improve with warming acupuncture, which is when the needles are heated. 2. Yoga: A study published in the journal Pain reveals that participants who practiced Iyengar yoga for four months saw their chronic back pain reduced by over 60%. Strengthening the muscles and improving flexibility i.e. through a yoga session can help those suffering from sciatica. 3. Chiropractic care: Approximately 60% of all people suffering from sciatica who tried spinal manipulation experienced the same degree of pain relief as patients who had surgery. A study published in the Journal of Manipulative and Physiological Therapeutics shows that 120 participants who saw a chiropractor three times a week for four weeks experienced pain relief. 4. Massage: Trigger-point therapy is what you should seek if you have sciatica. A licensed masseuse will apply pressure to irritated and inflamed areas, the trigger points in the piriformis muscle, along with muscles in the lower back and glutes. Schedule the sessions seven to 10 days apart. Piriformis stretch: Lie on your back and place both of your feet flat on the floor with your knees bent. Rest your right ankle over your left knee and pull your left thigh toward your chest. Hold the stretch for 30 seconds and repeat on the other side. Seated hip stretch: Get into a sitting position; move your right leg over your left leg (your left leg should be straightened). Hug/pull in your right knee with the opposite arm; ensure that your back is elongated. Hold this position for one minute. Repeat on the other side. Pigeon pose: Start in a downward-facing dog position and keep your feet together. Then draw your right knee forward and turn it out to the right so your right leg is bent and your left leg is extended straight behind you. Hold the position for five to ten breaths and then repeat on the other side. Self-trigger point therapy: Perform this therapy with a lacrosse or tennis ball. Find the painful spot on your glutes and place the ball at that location; relax your body onto the ball. Hold the position for 30 to 60 seconds or until you feel a reduction in the pain. Once the pain is reduced, move to the next painful spot. Spend no more than 10 minutes on this exercise. Winters, C., “11 Highly Effective Solutions For Sciatica,” Prevention web site, March 5, 2015; http://www.prevention.com/health/health-concerns/best-treatments-sciatic-nerve-pain. Sutherland, M., “4 Exercises For Sciatica Pain Relief,” MindBodyGreen web site, April 18, 2015; http://www.mindbodygreen.com/0-18298/4-exercises-for-sciatica-pain-relief.html. “Sciatica Causes,” Spine-health web site; http://www.spine-health.com/conditions/sciatica/sciatica-causes, last accessed July 31, 2015.